One of my sisters just graduated from medical school and is newly engaged, and to celebrate, my parents threw her a party with family and friends. My mom and I made quite a feast for our special friends and family, and I look forward to sharing many recipes from the party over the next weeks. The party was a luncheon, and since we had nearly 85 people, my mom and I made more "finger friendly" lunch foods. These chicken taquitos were a hit! 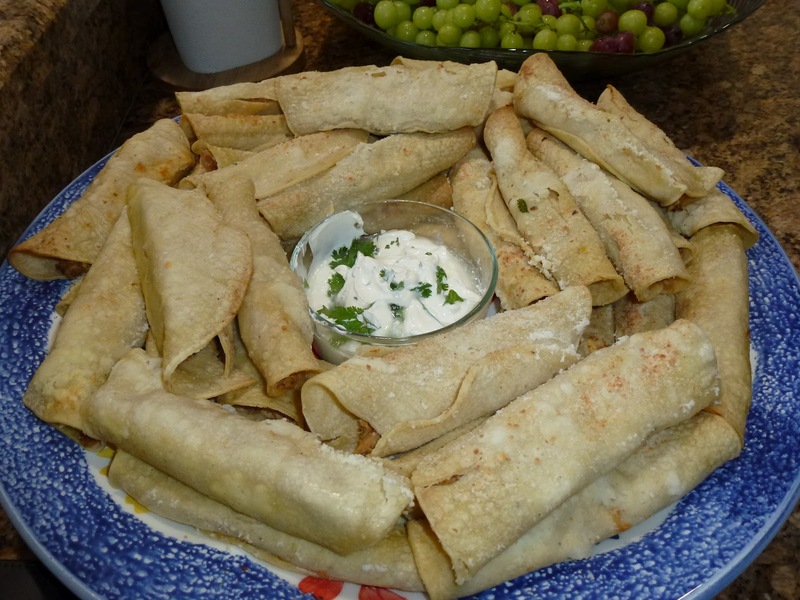 When my sisters and I were growing up, we liked having those chicken taquitos from the freezer aisle of the grocery store. So, it seemed a fitting dish to make for my sister. The homemade version is very tasty, and these are much healthier than the frozen counter parts. The tortillas bake up nice and crisp, and spraying the tops with cooking spray (or brushing them with butter) and adding a pinch of salt gives that "deep fried" taste without the calories. The filling can be prepared ahead of time, making this an easy crowd pleaser. The filling is a great base, and you can add in vegetables to boost the nutrient factor! Since my Doc sister is now a vegetarian, I made a batch where I swapped out the chicken for the vegetables. These freeze well, making them a great quick dinner, too. Preheat the oven to 425ºF. Spray a baking sheet with cooking spray. In a large mixing bowl, combine the cream cheese, salsa, lime juice, spices, cilantro, green onions, chicken, and shredded cheese. Mix thoroughly until well combined. Bake 15-20 minutes, until crisp and golden. Serve with desired condiments, such as sour cream and salsa. Note: To freeze before baking, transfer the baking sheet to the freezer and chill the taquitos for approximately 45 minutes. Transfer to a freezer-safe container. To bake straight from the freezer, just add a few additional minutes to the original baking time until the filling is warmed. Indeed it is always great to discover another lawyer turned baker. I swear, there should be a law school class for that! Thanks for visiting my blog and I will be sure to stop by your blog often. P.S. I love the blog's name!